Having watched Citizen Cohn in my younger years, I always marveled at how McCarthyism took root in our country. “That would never be able to happen in our country now, not with me around.” Well here we are 60 years later and once again the Russians are having a hand in dismantling our country. While times are different, the game remains the same. Discord, misinformation, and accusations of anti-nationalism abound with everyone talking and nobody listening. Bernie is getting ready for the night’s festivities while he is desperately looking for a letter from Senator Joseph McCarthy’s committee to which he was supposed to respond but he didn’t. As he finds parts of the letter, he starts getting phone calls that he thinks is about his big movie premiere, but are actually questions about whether he and Morris are pinkos. Pinkos? Bernie is flabbergasted, but this is just the beginning of a very long—and stressful—day for the writer. He starts getting more calls saying that he and Morris were named in a publication called “Red Channels.” The publication named individuals who were alleged Communist sympathizers. The calls come in fast and furious as studios and agents start dissociating themselves with the writing duo. Comments about Bernie and Morris attending a Communist meeting cause a panic as all their projects start to disappear. Stop orders and “change of creatives” cause The Danny Kaye Show, NBC, and the Marx Brothers movie to vanish into thin air. Playwrights’ Phil Johnson (who also plays Bernie) and Marni Freedman’s story is highly engaging and gut-wrenchingly authentic. They truly captured the manic panic of being named a Communist in 1950s America. Director David Ellenstein and Phil Johnson worked in perfect harmony, creating a world in which the audience was submerged in the hysteria and self-preservation of the Red Scare. 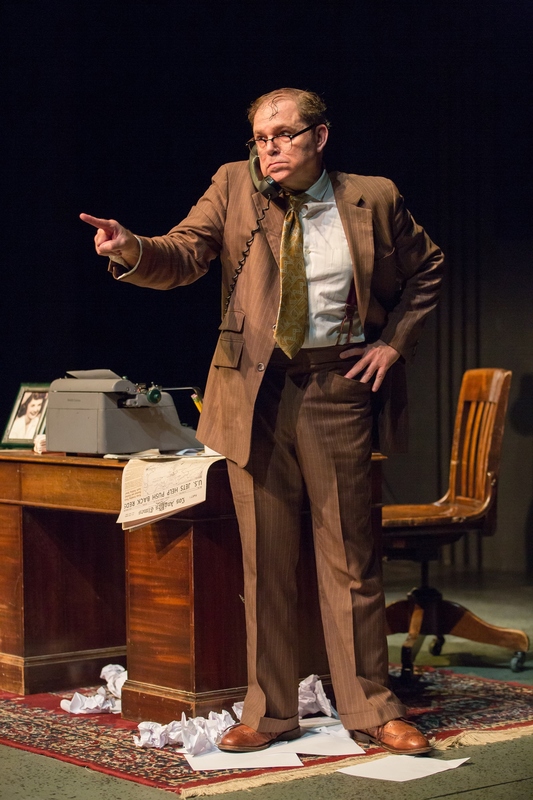 While a one-man show is normally a challenge in itself, A Jewish Joke takes it to another level as the audience watches a man fight for his life with only a telephone to serve as his lifeline to the outside world. Johnson’s performance as Bernie was exceptional. His ability to cope with his world crashing around him while delivering clever and entertaining jokes (via 3×5 note cards) was outstanding. The show is tagged as a “drama about comedy” and Johnson did both extremely well: his dramatic performances were sincere and his comedic delivery was top notch. His ability to deliver a 90-minute monologue without losing his passion and focus was inspiring. Phil Johnson as Bernie Lutz. Photo courtesy of The New Jewish Theatre. Another high point of this production was the combination of Laura Skroska’s props and Matt Lescault-Wood’s sound design. With Nathan Schroeder manning the soundboard, the telephone on the set was its own character. It was one of those older phones with a top cradle that is perfect for slamming the receiver on when you are mad. I believe the phone was actually ringing—or at least the crew made it appear it ring. Rather than using an obvious sound effect, the effect of a telephone “jingle ring” took me back to my youth. Also, watching Johnson having to wait for the rotary dial to end its rotation reminded me of how long it took to actually make a phone call. Along with the phone, the entire set was dressed exactly how I would imagine that a writer’s room in the 1950’s would appear.